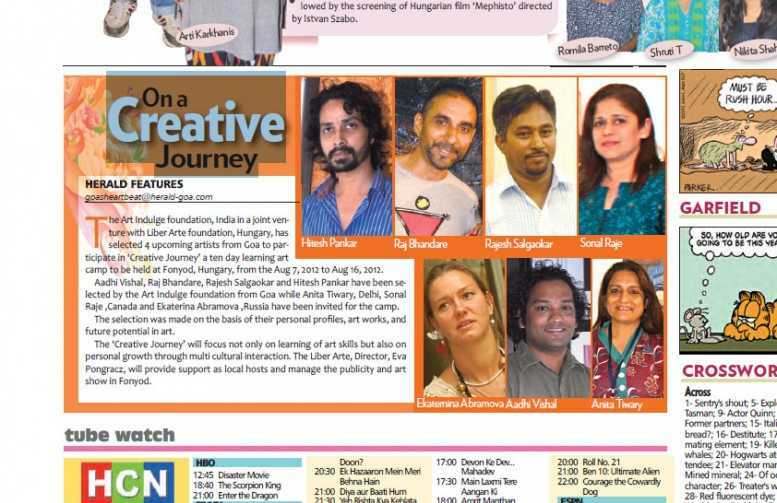 “The Art Indulge foundation, India in a joint venture with Liber Arte foundation, Hungary, has selected 4 upcoming artists from Goa to participate in ‘Creative Journey’ a ten day learning art camp to be held at Fonyod, Hungary, from the Aug 7, 2012 to Aug 16, 2012. Aadhi Vishal, Raj Bhandare, Rajesh Salgaokar and Hitesh Pankar have been selected by the Art Indulge foundation from Goa while Anita Tiwary, Delhi, Sonal Raje ,Canada and Ekaterina Abramova ,Russia have been invited for the camp. The selection was made on the basis of their personal profiles, art works, and future potential in art. The ‘Creative Journey’ will focus not only on learning of art skills but also on personal growth through multi cultural interaction. The Liber Arte, Director, Eva Pongracz, will provide support as local hosts and manage the publicity and art show in Fonyod”.